Preheat oven to 180°C/350°F. 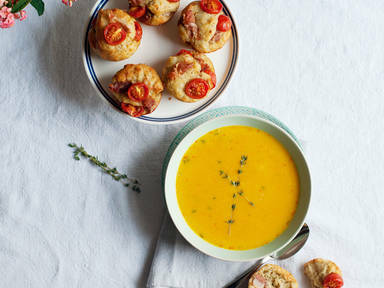 For the muffins, halve cherry tomatoes, cut Prosciutto into small pieces and grate Parmesan. In a large bowl, combine Parmesan, flour, herbs, and baking powder. Add yogurt, olive oil, milk, and eggs and mix to form a smooth batter. Grease muffin pan, if needed. Place half of the batter in muffin cups, top with half of the tomatoes and Prosciutto. Cover with remaining batter and place remaining tomatoes and Prosciutto on top. Bake for approx. 20 – 25 min. at 180°C/350°F until golden brown. For the soup, deseed and cube pumpkin. Cook in a slotted steaming container for approx. 8 min. at 100°C/200°F. Dice onions and crush garlic. Place in an unslotted steaming container along with some butter, cover with aluminium foil, and cook for approx. 4 min. at 100°C/200°F until translucent. Heat up vegetable stock in a large saucepan. Add cooked pumpkin, onion, garlic, orange juice, and zest. Blend until smooth. Stir in cream and thyme. Season with salt and pepper. Serve together with Mediterranean muffins. Enjoy! By clicking "submit", you’re consenting to our email newsletter with cooking content and information on products. You may withdraw your consent at any time.